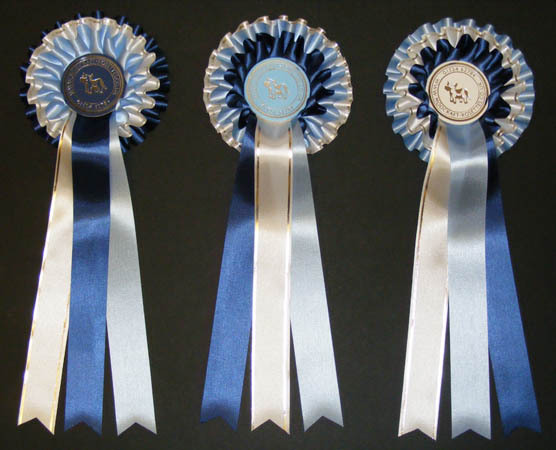 Our standard, most popular rosette, available in 1, 2 or 3 tiers. Comprises loose box pleated 24mm ribbon around a 68mm centre. 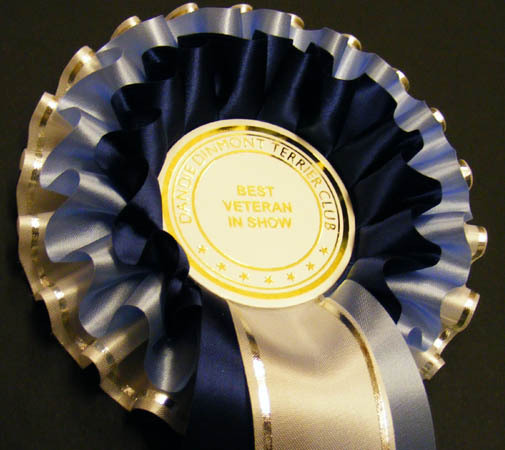 3 tiers of wider 36mm ribbon, creating a fuller, luxurious rosette for those special awards! Come complete with wider, longer tails. Choose 1, 2 or 3 colour combinations. Hectors look splendid with printed tails. 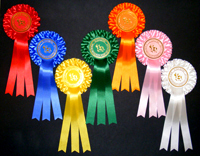 The Hector rosettes shown here have a tier of metallic ribbon. Whether it's one rosette or a whole show set you need, we aim to please. 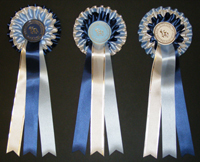 The rosettes here are a small selection showing what we can do. Click them for a closer look. 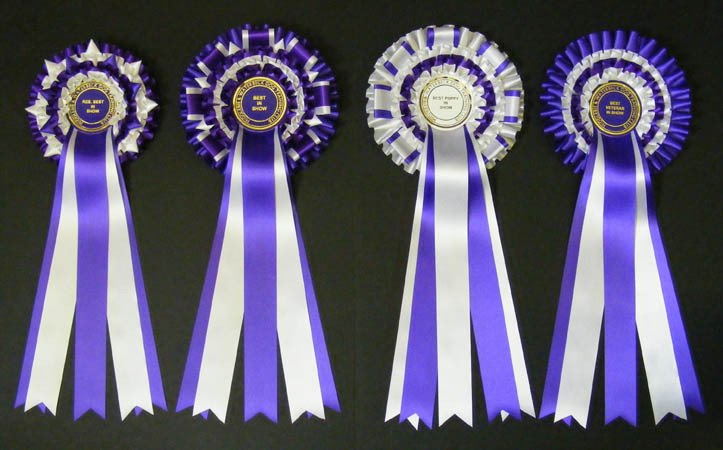 When a rosette won't do, why not award a Moocraft Sash. To win a sash is something special. Prices start at £20. 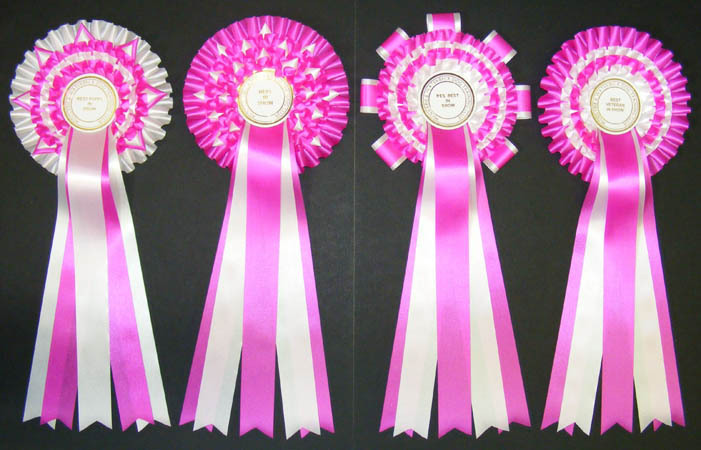 High quality single face satin ribbon sewn with matching thread. Your choice of silver or gold wording on each ribbon. Looped sashes for over the shoulder or around an animal neck. Straight sashes with tastles to put over an animal or for wall hanging. Badges - for officials and members etc. 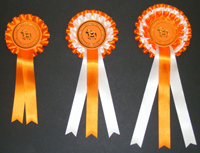 Our normal officials badges and rosettes are outlined here. If you require something a bit different, we are here to help.